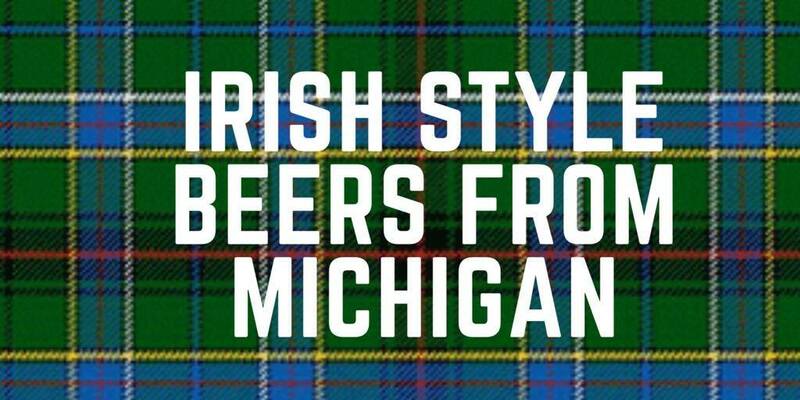 You don’t have to be Irish to enjoy these fine Michigan-made, Irish-inspired craft beers – available on draft or bottle/can distribution around the state. Sláinte! Michael Faricy’s Irish Stout (4.5% ABV | 42 IBUS). This crowd-pleaser has a dark coffee-like appearance with a creamy head and smoky, roasted grain aromas. It is rich and creamy on the palate with chalky, burnt flavors balanced by lush dark chocolates and never turns too dry through the smoky finish. Full-flavored yet highly drinkable—rich and creamy without being thick or heavy. It’s a limited addition so don’t miss this coffee-beer combo! Brigid’s Irish Red (5% ABV | 20 IBUs). The story of Brigid (pronounced “Breed”) is one shrouded in mystery; equal parts pagan history and Catholic sainthood, the one thing that seems to hold true is that she embodies the fiery spirit of Ireland. Our paean to her is held within the confines of a fine Irish-style red ale, a proud exultation that is bright, bold, and smooth. Brewed with molasses for a hint of jammy dark fruit, low-medium hints of earthy hops come through, and creamy malt provides a calming backbone. A modest alcohol content keeps everything convivial, as there’s plenty to toast come early spring. This brew is only available on draft! Loch Down Scotch Ale (8% ABV | 63 IBUs). Our tribute to the Scottish Highlands, this beer offers a gorgeous garnet color joined by the aroma of ripe plums and freshly-baked biscuits. The rich, full-bodied texture reveals notes of roasted chestnuts and caramel in the smooth single-malt style brew. Balanced with just the right amount of hop character, this beer delights with crisp alcohol finish. Pairs well with roast leg of lamb, roast beef, wild game, smoked salmon, Manchego cheese and toffee pudding. Lucky of the Irish is with you on this one, it’s available year-round. Red Rooster. A mainstay brew, red roosters were small steamboats that would run up and down the St. Joseph River, this brewery’s own town. The boats ran through for… “Recreational Purposes,” this was about 100 years ago, therefore this brew is names after the party boats. Sinuous Celtic Ale (5.6% ABV | 21 IBUs). A beer unlike any other, Sinuous joins together the subtle roast notes and malty finishes of an Irish Red with the crisp, hop forward features of a pale ale. A complex malt bill and three different kinds of hops will keep you satisfied during the crisp spring weather. Shirley’s Irish Stout (5% ABV | 25 IBUs). A smooth, yet rich stout, with lots of roasted barley, black & chocolate malts, creating a nice long finish. Nitrogen dispensed for extra creaminess. Sheehan’s Irish Stout (5.3% ABV | 40 IBUs). This is a very smooth and creamy, yet dry, roasty Irish stout. It has the delicate aroma of fresh chocolate and roasted barley. The flavor is well-balanced with the subtle fruity characteristics of an Irish Ale yeast fermentation and rich layers of chocolate, coffee and dry roasted malts. Lucky of the Irish… you can get this one right now! O’Briens Irish Red (5.6% ABV | 22 IBUs). Intended to be an easy-drinking pint, this Irish red ale is malt focused. The light to medium body is garnet in color with deep red hues. The flavor is defined by moderate caramel malt sweetness with a toasty or toffee-like quality that transitions to the light taste of roasted grain, which lends a characteristic clean, dry finish. Cernunnos (8.5% ABV | 25 IBUs). Scotch Ales, not to be confused with the smaller “Scottish Ales”, are rich and intensely malty. This is full-bodied and a sweet, yet has a smooth clean finish from a long cool fermentation. An extended boil promotes kettle caramelization and yields a darker color, deeper malt complexity and slightly roasty character. Moher Stout (9.7% ABV | 40 IBUs). This is a medium-bodied Double Irish Stout with light roast malt and bitter cocoa aromas that lead into a big creamy mocha flavor. Aided by the addition of flaked oatmeal, the finish is exceptionally smooth, with only a slight dryness and moderate roasted bitterness. Uncle Steve’s Irish Stout (5.8% ABV | 20 IBUs). Short’s version of the classic Irish Stout, complete with a dark color, soft head, and smooth full flavor typical of this lighter bodied beer. A simple grist formula provides a base of roasted malt flavors and a creamy drinkability everyone loves. Snakes on a Shamrock’s Irish Red Lager. The foundation of the brew is an Irish Red Ale style, but it leads to much interpretation, including the ability to be reformulated into a lager. The bulk of this brew is made from Pale Ale malt, the hearty of base malts. To lighten the beer, they use about 15% of flacked rice and then Crystal malts to for a touch of nice soft sweetness. It is then finished with a splash of Roasted malt and Amber malt to give the SOaS its deep ruby hues. This lager has little to no hop aroma or flavor due to the German Magnum hops used for bittering and balancing out the soft malt sweetness. The Volitionist Dry Stout Lager. A precisely measured balanced of American and British Roasted Barleys, Flaked Barley, and Chocolate Malt to give Volitionist its distinct profile, along with hops that are known to do well in ales and lagers alike. By allowing Volitionist ferment to total fruition it presents a huge degree of dryness, which in turn showcases the beer’s roasty subtleties. This brew has the commonalities of a traditional American Stout and a Dry Stout but the roastiness of the Dry Stout Lager is wholly unique to the concept. Ashley Dardis is from Otsego, Michigan and a recent graduate of Ferris State University where she majored in Event Planning in the Hospitality Management program. ← #MiWBF17 Features 969 Beers & 130 Breweries!